1. When you think you are hungry, drink 2 glasses of water then wait 20 minutes before deciding for sure if you need to eat something. Sometimes it's thirst, not hunger. 2. Don't wait so long than you are starved and overeat. 3. 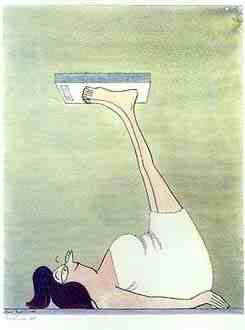 Weigh yourself every morning (or every other morning) - write it down (don't show it to anyone if you don't want to). 4. Quote from my doctor: "If it tastes good, spit it out." 5. If something you shouldn't eat tempts you, don't take that first bite. If you don't take the first bite, you will never overeat, of course you will eventually starve to death, but you get the idea. 6. Only eat healthy foods. 7. Exercise at least 3 times a week. Even if you don't lose weight, you'll feel better. 8. Have an eating plan, even if you don't stick to it perfectly. Change your plan if it isn't working for you. 9. Listen to your body. WHAT do you crave each time you are hungry? Is it carbs, protein, or fat? 10. Eat what you crave (either carbs, protein, or fat) but eat a healthy choice in that category, and don't gorge yourself. 11. Balance each eating session with 50% carbs, 25% protein, 25% fat (or whatever balance works best for you). 12. Find the right diet coach for you. 14. Write down everything you put in your mouth, unless you are becoming obsessed, then don't write down anything for awhile. 15. If you are over 45, and have been consistently eating properly and exercising, feel like you are starving, crave everything, can't go for more than 1 1/2 hours without eating, and can't lose an ounce no matter what, it might be due to hormones (peri-menopause/menopause). Try The Menopause Diet - then let me know if it or anything else works! 18. Eat 250c per meal, and no meals closer than 3 hours apart. 19. Or, eat 250c to 350c per meal for your 3 main meals, then have 1/2 cup of plain Kefir between meals to tide you over. It was nearby in the closet. I may never have an opportunity to eat this particular food again. It's hot now, and if I don't eat it, it will get cold. It's cold now, and if I don't eat now, it will warm up. I'm happy and really should celebrate. I gained a pound so it doesn't matter anyway. I lost a pound so I deserve a reward. I already ate one bite so the next 50 (until I'm stuffed) don't matter. I already "blew" my diet so I'll just punish myself by blowing it more. It's not my favorite but I might get hungry if I don't eat it. This food is really special so I should appreciate it by eating it. This food is really expensive and I don't want to waste it so I must eat it. Everyone else is eating so I must eat too. Okay, I ought to be about 115 lbs, considering my weight history, height, frame, etc. (I was 118 lbs on my 25th wedding anniversary and had never had a weight problem before that.) BUT, about 5 years ago when I began to close in on the age of 50ish, everything changed, I gained 20 lbs. in 2 months, and despite trying every diet imaginable, could not lose an ounce. Then, a few months ago, I finally had a breakthrough and lost 10 lbs and have kept it off. How did I do it? Well, mainly by focusing on Diet Tip Number 16 above: AVOID EYE CONTACT! We had just arrived in Florida for 2 weeks and I told my children that I was not setting foot in the kitchen while we were there. I told them they were taking over all the kitchen duties (they already help a lot anyway so they knew what to do) and that I wanted them to just deliver my meals (pre-determined by me to be small and healthy) to me at the specified hours. It worked. For the first time in 5 years I was able to stick to a lower calorie diet plan and stop nibbling and cheating. Keeping the 10 lbs off has been harder, but so far I've been successful, since I have moved back into the kitchen. I would like to lose another 10 lbs., but seeing food and going out to eat are my two biggest enemies. Despite my best and more constant intentions, I have NO willpower if I see food in front of me.